The 2016 Missouri-Hurley Symposium featured speakers are (left to right, starting at top): David Kurpius, Barbara Cochran, Earnest Perry, Stacey Woelfel, Tim Tai, Morgan Young, Adora Jenkins, Jeffrey Herbst, Bryan Monroe. Columbia, Mo. (March 1, 2016) — What happens when a news story about racial discord, university leadership and academic freedom becomes an international sensation on social media and attracts dozens of news organizations to Missouri? What did faculty and students of the world’s first journalism school learn about diversity, inclusiveness and the clash of First Amendment freedoms during the fall 2015 campus protests? 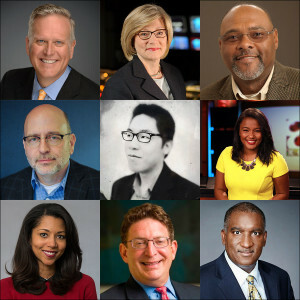 Lessons from Missouri: Diversity, Inclusion and the First Amendment will be discussed at the Missouri-Hurley Symposium on Thursday, March 17, at the National Press Club in Washington, D.C. The reception will begin at 6 p.m., with the program to follow at 7 p.m. The event is free. Register at www.mizzou.com/DCSymposium. Dean David Kurpius will give alumni and other guests an update from campus. Kurpius joined the Missouri School of Journalism in July 2015. Previously, he served as associate vice chancellor for enrollment management at Louisiana State University. There, Kurpius managed 89 staff members and a $5.6 million operating budget. He also oversaw almost $305 million in state and federal financial aid and scholarships. The Missouri-Hurley Symposium is sponsored by the Missouri School of Journalism and the Curtis B. Hurley Chair in Public Affairs Journalism. Mar 31, 2004: Upcoming Hurley Symposium to Discuss: "Where Is the Public in Public Affairs Reporting?"